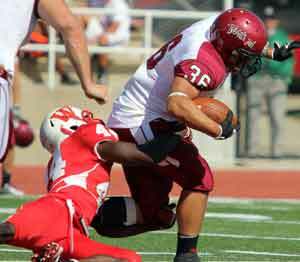 Wabash came back from a two-touchdown deficit to knock off previously unbeaten Carnegie Mellon Saturday, 54-28. Senior quarterback Chase Belton had a record-setting day with four passing and three rushing touchdowns. The seven touchdowns by Belton are the most by any player in a single game in Wabash College football history. “Chase ran the ball great and did a great job finding the open guy and putting the ball on him,” Coach Erik Raeburn said. Belton turned in one of the best games of his career. He ran for 198 yards while throwing for 183. Belton accounted for five touchdowns in last year’s homecoming game against Kenyon. The Little Giant offense clicked on all cylinders, and then a few extra. It totaled 566 yards in total offense and put up the most points it has scored all season. After averaging slightly less than 100 yards per game, the Little Giant ground attack busted out for 383. Running backs Tyler Holmes, CP Porter, and Vann Hunt had 98, 58, and 43 yards rushing respectively. The zone running game worked all day. Belton either handed the ball to his back or decided to run it himself. He and the running backs consistently found gaping holes and green grass straight ahead. 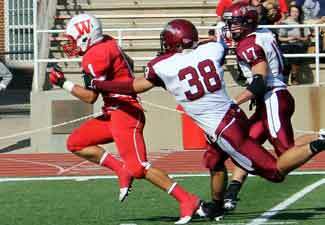 The 383 yards are the most rushing yards for Wabash since 2003 and are the fourth most in school history. Carnegie Mellon scored a touchdown its first two series. Sam Thompson returned a punt 92 yards for a touchdown to give the Tartans a quick 21-7 lead. The defense then came to life. Linebacker AJ Akinribade sacked Tartan quarterback Rob Kalkstein on a second and long during the team’s first possession of the quarter. Akinribade snuffed out a screen pass on the very next play and forced the Tartans to punt. After Akinribade and the defense forced the punt, Belton marched the ball into the red zone again. A key play on the drive occurred from the Tartan 32 yard line. Facing third and 14, Belton found junior Andrew Gibson on a post route over the middle. Gibson jumped up for the ball and corralled it on the way down. The 26-yard completion set up a Belton touchdown run to tie the score at 21 and bring the Homecoming crowd of more than 5,000 back into the game. The Little Giants got the ball back at their own 20 with 1:53 to go in the half after the defense forced another punt. Belton and his receivers shined in the two-minute drill. Belton was 4-4 on the drive for 34 yards. He scrambled for another 48 yards. The drive was capped by a touchdown throw to Hildebrand. Carnegie Mellon got the ball back with 37 seconds and moved the ball into field goal range. The 38-yard field goal attempt was blocked by freshman linebacker Tyler McCullen to keep the score 28-21 at the half. The blocked kick gave the home team a lot of momentum heading into the locker room while the visitors silently walked off the field. The Little Giants maintained momentum starting the third quarter forcing a Tartan fumble. And then Wabash picked up a 31-yard Ian MacDougal field goal, but the Tartans countered with a Kalkstein to Patrick Banks 38-yard score, 31-28. Wabash steamrolled the rest of the way. Andrew Gibson caught a three-yard pass for a score then two minutes later Houston Hodges, playing both sides of the ball Saturday, notched a 30-yard TD – the first of his Wabash career, 44-28. That quick turnaround was made possible by a gutsy but unsuccessful fourth down run attempt. MacDougal hit from 24 yards before Belton added his third rushing touchdown and the final, 54-28. Houston Hodges had two catches for 79 yards and a touchdown. He also had five tackles. Justin Woods and A.J. Akinribade led the Little Giants defensively with 14 and 13 tackles, respectively. McCullen and Akinribade eached chipped in with a sack for Wabash, while junior captain Nate Scola added 11 tackles, a tackle for loss, and a blocked punt. Just back from missing most of the Allegheny game, Cody Buresh returned with 10 tackles and a tackle for loss.